A photographer for a popular North Pattaya Thai club was arrested for allegedly selling crystal methamphetamines through Facebook. 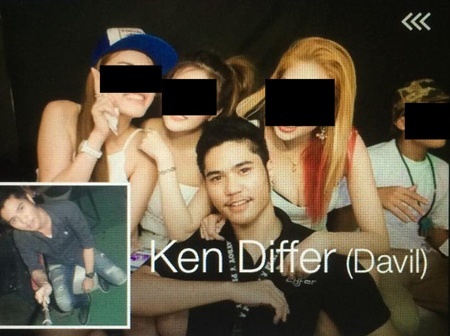 Pataweekarn Jaipang, who went by the name “Ken Differ” on Facebook, was captured in a sting operation by undercover Sattahip police around 2 a.m. Jan. 8. He claimed to be the photographer for the Differ pub near Central Center. Pataweekarn Jaipang, aka Ken Differ, has been arrested for selling drugs through his Facebook page. He was captured with two bags containing a total 2.9 g. of ya ice, a digital scale, 23 38-caliber bullets and the 2,500 baht used by the undercover agent to purchase the drugs. Police said Pataweekarn confessed to dealing drugs, using his photographer job as a cover. He said he advertised drugs on Facebook then arranged to deliver the narcotics.